When I returned to Palestine in September 1978 to join the Biology Department faculty at Birzeit University, I found that the faculty, staff, and students were involved in community development and outreach activities. Community service was and is an integral part of the University’s mission (as central to its mission as a commitment to academic excellence); and faculty members had initiated the Voluntary Work Program (Munir Fasheh), the Archeology Program (Albert Glock), the Literacy and Adult Education Program (Khalil Mahshi and later, Hiyam Abu Ghazaleh), and the Research Center (Khalil Mahshi and Kamal Abdulfattah). This was one of the features of nonviolent resistance to Israeli military occupation in the form of community service and the building of Palestinian institutions independent of the Israeli military. One of my students, Mohammad Said al-Hmeidi, and I began to develop a community and public health program from a garage/storage “office.” Because Birzeit University was small, faculty and students had close, informal, and cooperative relationships, which facilitated the development of multidisciplinary teams of researchers/activists. This proved to be crucial for our approach to public health, which combines biomedical knowledge with an understanding of societal phenomena and the context in which people live. Early on, we set out to generate the data needed for the planning and implementation of health services. At the time, most Palestinian health service planning was based on assumptions regarding people’s health needs. (We called it “planning behind the desk.”) Our first study was led by Birzeit University social scientist Salim Tamari and was completed in Zbeidat in the Jordan Valley. He assessed the social impact of the introduction of drip irrigation techniques in this peasant community, and we investigated health conditions. The study demonstrated that health is a social construction; that housing, water, sanitation, and nutrition are key elements producing health or disease; and that clinics and hospitals addressed disease only after it set in. We concluded that work was needed both inside and outside health services, and with communities, in order to prevent disease and to promote and protect health. The results of this study were used to set up a clinic in Zbeidat and to train a village health worker from Zbeidat at Bethlehem University (which was at the time training male village health workers) in order to work on issues such as sanitation, health education, and nutrition. Unfortunately, the clinic did not survive long, because we did not provide the necessary follow up and support to the isolated village health worker. The experience taught us that conducting research was not enough; we had to maintain ongoing involvement through training and supervising workers and monitoring and evaluating health projects that we helped initiate. Indeed, this has been the work cycle and cardinal rule we implemented at Birzeit University’s Institute of Community and Public Health (ICPH). 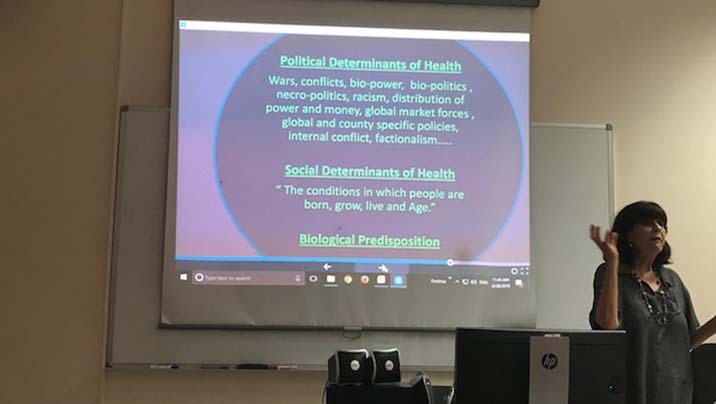 Professor Rita Giacaman discussing social and political determinant of health in Palestine. Social Medicine Training Course,July 4, 2018. We also learned from the mistakes of others. When we began our second health survey in 1981 in three villages near Birzeit, we knew from the Bethlehem University experience that we should train female and not male health workers, because only women are able to enter homes and gather information on context, environment, nutrition, and so on, all of which are essential for effective primary health care work. Our experiences gave us an understanding of primary health care before knowing how the World Health Organization defined the term in the Alma Ata Declaration of 1978 and especially the three pillars that support it: community participation, intersectoral collaboration, and equity. Our knowledge and understanding of health was gained in practice first, with theory later supporting the evidence that we generated from lived experience and from research. This reliance on data drawn from both research and practice continues to characterize the approach of ICPH. The Birzeit villages study turned into one of the most important ICPH programs because it built on previous failures and succeeded; because it taught us to continually assess before moving forward; and because it helped us appreciate the importance of collaboration with other local institutions. This program was conducted jointly with Birzeit Women’s Charitable Society, which was already operating a clinic in Birzeit village under the leadership of a powerful nurse, Georgette Abed. The clinic was attended a few hours a week by a physician who offered growth monitoring and immunization services to the children of Birzeit and surrounding villages. We built on what existed. We set up a clinical laboratory, needed for quality diagnoses; increased the number of hours that the physician attended the clinic; developed curricula and trained women village health workers from seven villages near Birzeit; employed a midwife for clinic work and home visiting; supervised and supported village health workers; and focused on home visits, health education, and community mobilization for the solution of selected problems, such as sanitation and housing problems, among other activities. We worked closely with all relevant parties to operate a comprehensive primary health care program, including working with the villagers to install tube/potable water supplies to improve sanitation, and to bring the University’s Literacy and Adult Education Program into our catchment villages. We also combined the village health program with student health care. That was the beginning of student health services at the University. This brief note appears in the 2010 book “Birzeit University: The Story of a National Institution,” which was edited by Ida Audeh. The book chronicles the development of Birzeit University by retelling the stories of those who helped establish it. In its three chapters, the book presents the history of Birzeit University, from its early beginnings as an elementary school all the way to its present status as a full-fledged university, along with the challenges and obstacles that it faced during its time and its prominent role in the Palestinian community.